After a less than inspiring visit to Bologna yesterday, I’m determined to do better today. Over breakfast, I unfold a map and consider my options. The Hotel Davanzati has a sister company called I Just Drive, which offers a number of small group tours. I had hoped to go on their outing to Pienza, Montalcino, and Montepulciano, but as in Venice my timing as a solo traveler is bad. No one else has booked the trip this week, so it’s understandable that it’s been cancelled. Modena could be reached by train, but Tommaso thinks it’s too far to go for the day. Ferrara is within reach, but Fabrizio wouldn’t recommend it. I’ve already been to San Gimignano, and while it’s a stunning town with soaring medieval towers, it’s too small to consider going back so soon. 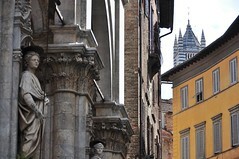 And tomorrow I’m heading west to Lucca and on to Pisa, so those destinations are out as well. I consider Fiesole for a moment, or maybe Pistoia, but I decide to roll the dice and lay my bet on the surest thing I know. 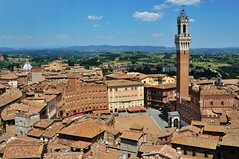 I’m going to revisit the classic Tuscan hill town of Siena. 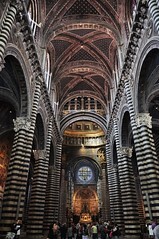 I went to Siena on my first trip to Italy back in 2008, but after touring the Palazzo Pubblico to see the frescoes depicting “The Allegories of Good and Bad Government,” and climbing the Torre del Mangia, I was too weary to bother with the cathedral or the baptistery or the adjacent Museo dell’Opera del Duomo. I spent the afternoon instead wandering the hilly streets in a happy stupor induced by some truly excellent food. It was a memorable day. Only later did it occur to me that I had missed the finest view of all, which is reached from the top of an unfinished wall of the Duomo, abandoned in the 14th century when the Black Plague swept through the city. My return today is all about unfinished business. 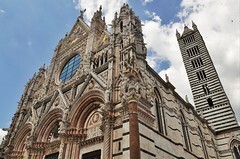 I walk to the SITA terminal near Santa Maria Novella and board a corse rapide bus that offers little in terms of scenery, but gets to Siena via the autostrada in little more than an hour. By 11:30 AM we’ve arrived at Piazza Antonio Gramsci and just as before, I follow the crowd of day trippers along Via Banchi di Sopra toward the city center and Piazza del Campo. I stand on the sloping pavement for a few minutes, soaking in the surroundings and the grandeur of the Palazzo Pubblico. There are pigeons bathing in the Fonte Gaia, children playing tag, and people lounging with their backs upon the warm bricks. It’s such a lively and pleasant place to be on a summer’s day that I’m tempted stay and eat lunch at one of the cafés that line the campo, but the meal I had here in 2008 was so exquisite that I feel obligated to find something that competes. I pull up some TripAdvisor reviews on my iPhone—a wonder of technology that wasn’t at my fingertips the last time I was here—and opt for a table at Dolceforte. The owner, Anna, is sunny and gregarious, and justifiably proud of her food. I order a plate of wild boar ragù, and an arugula salad with walnuts, pears, and pecorino cheese, drizzled with a homemade balsamic reduction. Everything is delicious, especially the balsamic and when I tell her so, she beams. With fuel in my stomach and energy in my legs, I decide to tackle the most trying item on my itinerary first—the narrow, corkscrew stairway that leads to the Panorama del Facciatone. Because I am determined to do things properly this time, I invest in an all-inclusive Opa Si pass for €12, then enter the Duomo museum and start climbing. There’s a waiting line to get there, but the sight of Siena at my feet more than makes up for the bottleneck. Between the height of the unfinished nave wall and the topography of the land, I am high above the fan of Piazza del Campo, as if floating on air. It would be difficult to imagine a more sublime view. Once outside again, I round the corner to get a better view of the cathedral itself. It’s a lacy confection with a round window that reflects the clouds and the blue of the sky. The pink and green marble reminds me of the basilica of Santa Maria del Fiore in Florence, but the Gothic spires and the gold mosaics have me thinking of Orvieto instead, which makes sense since the architects there were Sienese as well. In many ways, Italy is still a conservative country, and a devoutly Catholic one, too. While in America, someone might attend mass on a Sunday morning wearing shorts and a halter top, there are standards of modesty here—shoulders at least, and often knees, must be covered. Surely, that’s not asking too much? I carry a scarf in my purse for such occasions, although today it is a looking a bit tattered and worse for wear after that wrestling match with the zipper on my purse in Bologna. But at least I come prepared. For those who don’t, there are disposable paper capes that must be worn, and they make people look positively ridiculous, as well they should. If only they could ban flip flops, too, I would be well satisfied. Once I visit the crypt and the cool darkness of the baptistery, I’ve completed all the sites covered by my Opa Si pass, so I’m ready to wander about. I stop for some raspberry and lemon gelato at Grom, window shop for ceramics that display the coats of arms of the seventeen contrade of Siena that compete in the Palio each year, and buy a few ricciarelli cookies from Nannini to eat later. By half past four, my legs have given out on the hilly terrain and I decide to catch the next SITA bus back to Florence. It’s been a scorching day and the slant of the afternoon sun warms the bus dangerously. By the time we reach the entrance to the city at Porta Romana, the temperature gauge on the dashboard is reading 40° Celsius, or more than 100° Fahrenheit. Back at the hotel, I lay down to rest for a bit in my room and once again crank up the air conditioning. A while later, I come out for one final Happy Hour. As usual, there is music playing in the background, there are candles on the tables, and a dish of crostini alongside the hotel’s own Davanzati sauce. There’s a full house tonight, so I’m sitting at a table in the lobby when Tommaso comes over and sits down to join me. He leans over and peers into my glass. “What are you drinking,” he says, half curious, half amused. “Is that Coca-Cola?” Yes, I say, burying my face in my hands. With a good-natured grin, he says: “We do offer prosecco and Chianti, you know.” Will the embarrassment never end? Am I forever destined to be either pitied or scorned as “the woman who no drink wine”? After enduring the heat on the bus, I can’t muster enough hunger to warrant going out for dinner. I grab a sandwich from the takeaway counter of a café instead and head over the Ponte Vecchio to buy a ceramic piece I saw in a shop there the other day on my morning tramp around the Oltrarno. The sign reads Sciccherie: Artigianato d’Arte Italiano. The woman behind the counter recognizes me and she introduces herself. Her name is Tiziana. She is kind and she enjoys practicing her English, which encourages us to talk. When I pick out an occupational plaque that depicts a L’INSEGNANTE, or teacher, she asks if I am buying it for myself, and I nod. At that, she wraps it carefully, first in bubble wrap, but then in paper, and ties it with a brightly colored ribbon, treating it with the care of a special present. “It is a gift you give yourself,” she says, and I like the sentiment very much. On the walk back to the hotel, I stop and listen as Claudio Spadi sings Venderò. 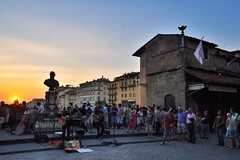 Tonight, Luca Sciortino has joined him and the mood on the Ponte Vecchio is as mellow as the setting sun. As I sit on the edge of the curb, I think about Tiziana and about Giovanni Turchi and the young man in the workshop of the Scuola del Cuoio, about Claudio who sings his heart out every night, and about Tommaso and Fabrizio back at the Davanzati. They’ve all been so nice. 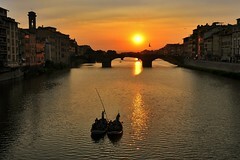 Perhaps that’s why I’ve grown fond of Florence over the years, and why I always feel wistful when it’s time to move on. It’s a strange feeling, to be so much at home in a place so far away from home, but there you have it. 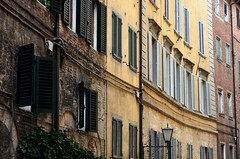 When I pass the Mercato Nuovo, I make sure to drop a coin in the mouth of Il Porcellino and to rub his well-worn snout. It’s a ritual I’ve held to each trip on my final night in Florence. I suppose that means I’m a bit superstitious after all. I know it works, though, because I always come back.